When start moving up the years in whisky, the more of a treat it should be. Flavours become enhanced and the malt twists and turns over the years to refine and develop more character. The Bladnoch forum every now and again offers a cask bottling, bottled by themselves and sold to forum regulars. It offers a chance for some speculative purchasing, without fear of losing too much cash if the dram doesn't turn out well. Not that this would happen, as it has a seal of approval from the releases I've tasted. 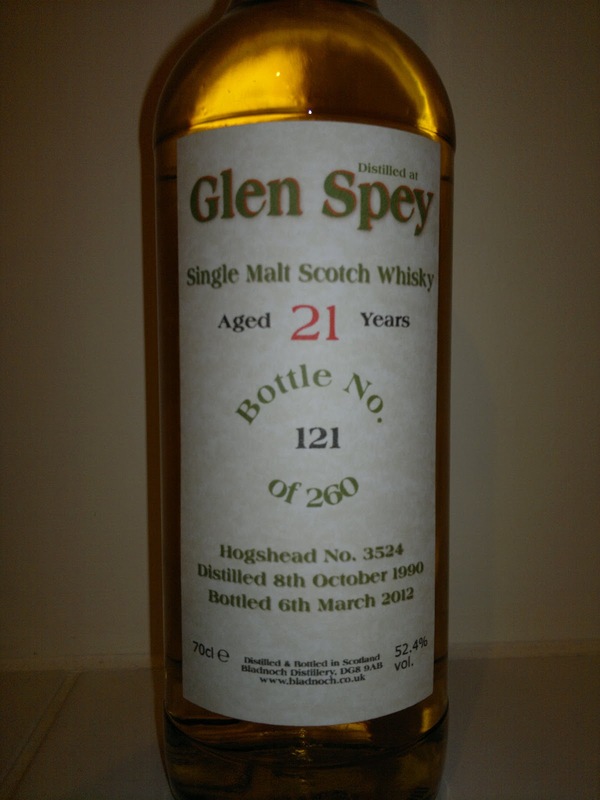 Glen Spey doesn't turn up very often, as most of its produce is for blending. You do get an independent bottling like this now and again. Or Diageo may release a small number annually for its rare malt range. This is best comparison we have to this 21yr malt is the very well received 2010 Diageo release that is around three times the price. Glen Spey is a very drinkable malt and this is confirmed within seconds. There is a mellow, tranquil warming of the orchestra before the flavours start coming through. Almond, spice, orange; one after the other, classic combinations that always delight. The duration of finish is impressive with a nutty hint. 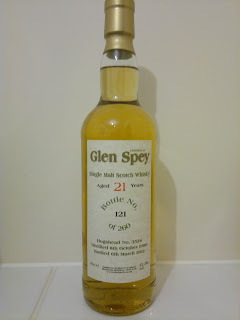 This has more to say thanks to the additional years than most Speyside malts. I could drink this quite happily all night and for the price it packs a punch. 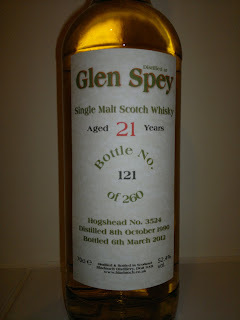 This is a bottle that will impress most whisky lovers and offers something a little off the beaten path. Now, time for another.